Larger-than-life Detective Inspector Vera Stanhope needs to face up to the demons in her own past when John Brace, a friend of her late father, now disabled and in jail for life, offers her the location of the body of Robbie Marshall, who’s been missing for twenty years (in exchange for protection for his daughter and her children). Agreeing to the offer, Vera investigates the site described by John Brace and discovers not one body but two. As Vera confirms the first is that of Robbie Marshall, and tries to solve a twenty-year old murder, she also has to try to identify the mystery woman who appears to have been buried with him. 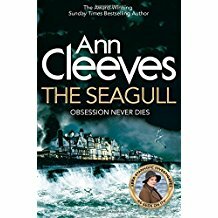 Her investigations keep leading her back to a notorious night club, The Seagull. Now closed, the club was popular amongst the criminal set in its heyday, twenty years earlier. Vera also has to look more closely at the life of her father, who had his finger in a number of illegal pies as part of the Gang of Four, a group that also included John Brace and Robbie Marshall. With a well-established series and a TV show, Vera Stanhope already has an established following, and it’s always a danger in such a situation that a new reader won’t be able to follow the latest story. However, I came to this book with no prior knowledge of Vera’s earlier adventures, and there was enough back story for me to pick up the threads of Vera’s life without any problems. Vera is a likeable character, and the back story of a Detective Inspector with an illustrious and successful career catching bad guys being the daughter of a notorious criminal is an interesting one, adding an extra dimension to the usual DI of crime fiction. Both established ‘Vera’ fans and lovers of police procedurals coming fresh to the series will find much to like in this novel.